A 20-year-old Lincoln woman won the Logan County Fair Queen Pageant on Tuesday evening. 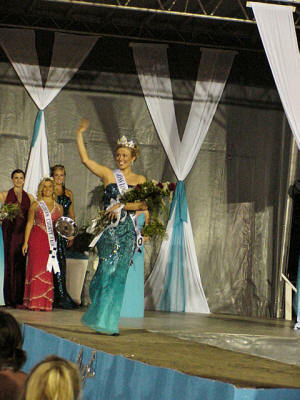 Katelyn Frontone takes the runway after being crowned 2006 Miss Logan County Fair queen. Even though temperatures still hovered near the 90-degree mark and humidity remained high, a steady southerly breeze allowed the grandstand crowd to enjoy the outdoor event. See complete story in Today's Top Stories. Listen to CITV5 'Wednesday Night Live,' 7-8 p.m.